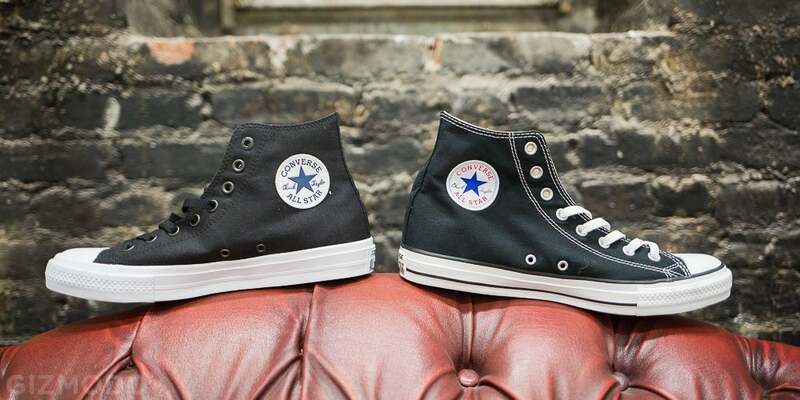 Welcome to the new face lifted Chuck Taylor (left). Now you can probable see a few differences straight away but let's have a closer look. Gone are the black strips that outlined the white rubber base. The contrasting stitching and eyelets have now been replaced with matching tones to mach the canvas colour of the shoe. The Logo is now embroider like the Chuck 1 leather versions. These new shoes are made of a more durable material. Lets see if they tackle the two problem areas, the heal coming away from the rubber and the rubber splitting on the sides where it bends. The sole of the shoe is now a more natural gum colour. They now come with a perforated liner. To make them more comfortable they have a new insole designed by Nike. The heel Logo is raised rather than printed. The biggest news ever though is that damn slippery tongue has been replaced with a non slip padded version. Now the big question is do they keep the classic feel of the original Chucks. It definitely looks like a grandad and grandson alternative, however the biggest issue we have is the lose of the iconic contrasting stitching. For us this one issue would always point our feet in the way of the originals, they may be old, but they are certainly not obsolete.